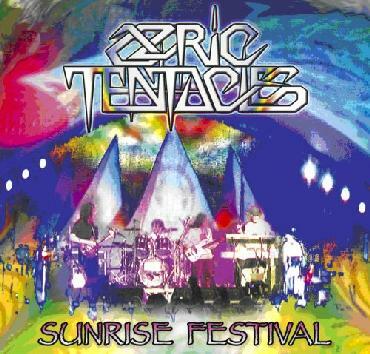 Ozric Tentacles - "Sunrise Festival"
This release is suppose to mark the 25th anniversary of the band and it is an amazing sounding set with Ed, his wife Brandi on Bass, Joie on Synths and Merv on Drums. This was a bit of a reunion for a special festival and since Joie and Merv don't really know any of the new stuff, it is a total old school set. It would have been really nice if Jon had joined in as well instead of having his flute parts sequenced, but I think the way he was treated he will have nothing ever to do with the band again unless Brandi is hit by a train or something. Joie is totally awesome. He was always the freaky one and he plays such cool stuff. Great sound, nicely filmed and amazing sound makes this double CD/DVD well worth it. It is too bad that this line up was only for a few gigs here and there and is no longer playing but here they were captured having a great time and playing a great set. If you like the early 90's era Ozrics then you will love this for sure. The classics Eternal Wheel, Jurassic Shift, Erpland, The Throbbe, Snakepit and others are belted out. Great sound mix.